Scroll down for the YouTube video. Old video! 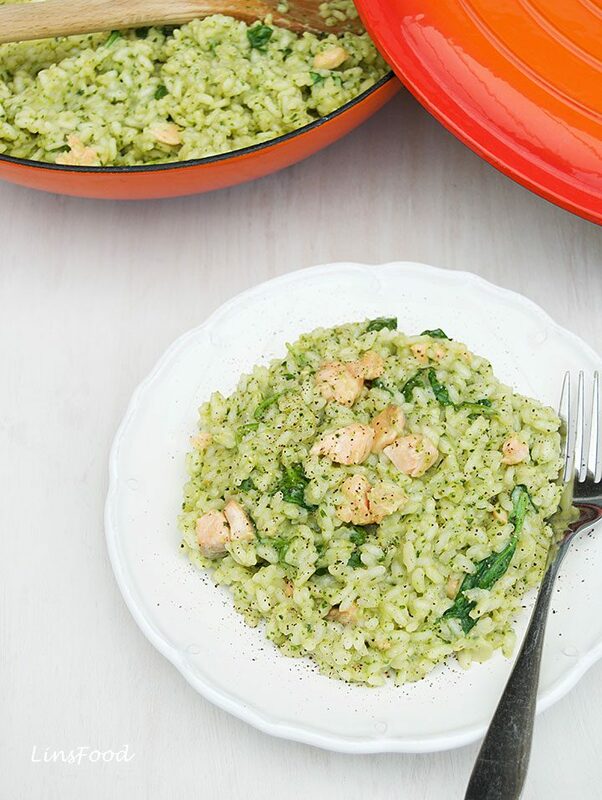 Pesto Risotto with Salmon is an extremely easy recipe to put together, perfect for a midweek meal, when many of us prefer to do quick and easy. Sure the risotto does need quite a bit of stirring but it can all be done in 30 minutes from start to end, provided you have the pesto all made before hand. As pesto keeps so beautifully, plan ahead and make the pesto over the weekend. Having a jar of homemade pesto in the fridge is very handy for the busy cook. If you’ve never tried your hand at making pesto before, I urge you to give it a go, it’s a 5-minute job that goes a long way! If you’re really not inclined, then make sure you always have a jar or two of a good shop bought variety. I love pesto, and use it so many different ways, these are just some of them. 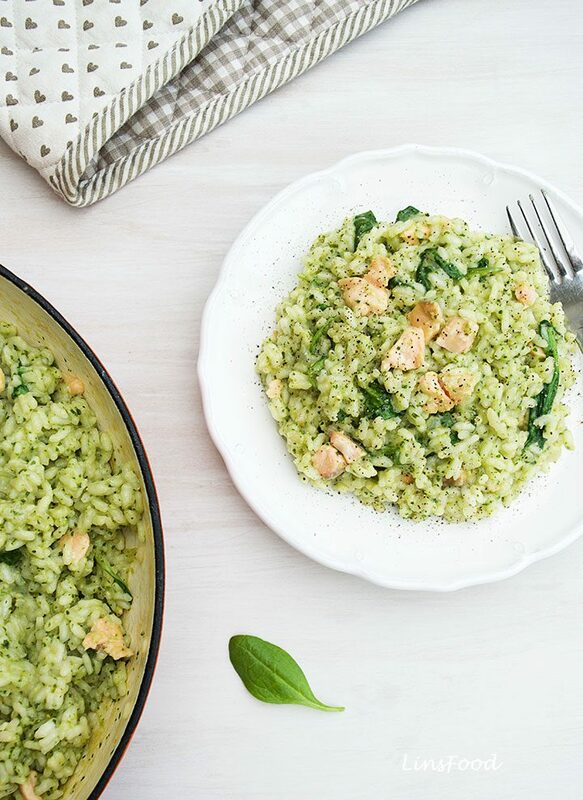 As mentioned, our Pesto Risotto is super simple, we start with the basic risotto, risotto bianco (white risotto), and before adding the parmesan, we jazz it up with the pesto and the salmon. In fact, risotto bianco is perfect on its own and to me, very filling too. It is the perfect platform for endless creativity – the obvious mushrooms but you can also go with meat, olives, anchovies or your favourite vegetables and this time of the year, pumpkin is a great choice. 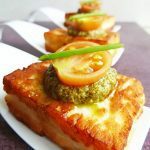 Contrary to popular belief, Italians do keep their leftover pesto and this is super delicious reheated the next day! As a matter of fact, unlike pasta, which is eaten piping hot, risotto is left to settle for 5-10 minutes before being served. You can make this pesto risotto ahead, in either of the following ways. However, do bear in mind, that texture wise, a freshly cooked risotto, that’s had a 5-10 minute rest, would be vastly superior. Make it completely the day before, and very gently reheat on the stove before serving, adding a ladle of stock or just water to lighten it. Or, stop at step 6, before adding the salmon in, with about 2 ladles of the stock left. 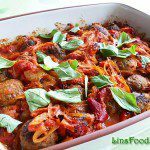 Cool, keep in the fridge, then finish off the next day before serving. This second method will ensure that your fish doesn’t overcook. Making your own pest takes no more than 10 minutes. Did you know that? However, use a shop bought variety if you prefer. 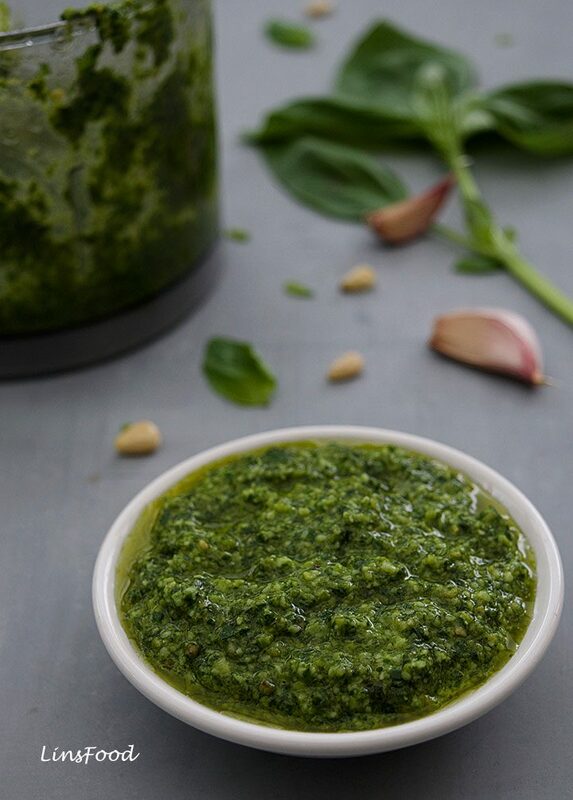 If you do fancy making your own, click here for our Pesto Recipe. The fish stock wants to be kept simmering away, so it doesn’t bring down the cooking temperature in the pan every time you add it. If you are using homemade or ready made stock, dilute it this way: 500ml (2 cups) stock + 500ml (2 cups) water. If you are using cube or stockpot, the usual strength is one cube/pot to 500ml (2 cups) water. For this recipe, 1 cube or stockpot will be perfect for he whole recipe, for half strength stock. So 1 cube/pot to 1 litre (4 cups) water. Use the best you have, the sort you would drink, don’t ever use wine sold cooking wine. Omit if you don’t want any alcohol, and there shouldn’t be any need to increase the liquid amount. Purists will tell you that Italians will never add cheese to seafood. I shall deal with that topic in an upcoming post, and will link back here. However, you will find this traditional rule being broken more and more in Italy but always bearing in mind the final flavour. It won’t always work! In this recipe, as we are using pesto, which contains cheese, I have taken the liberty of finishing off with a small amount of cheese. The taste is phenomenal, it just takes it to another level. 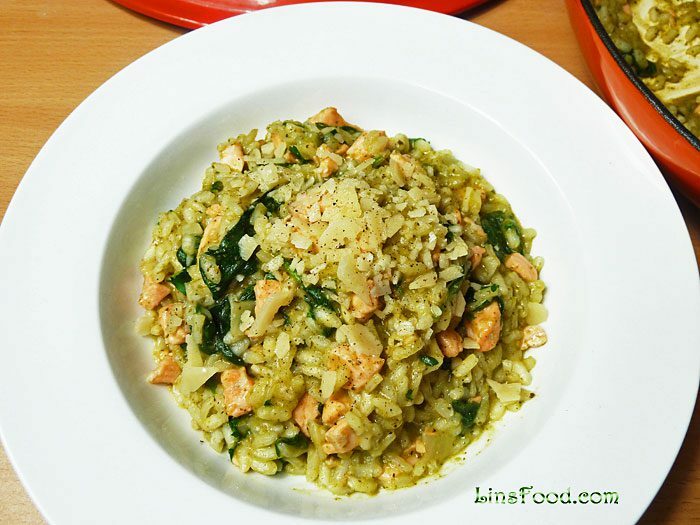 And finally, here’s an old YouTube video, showing me making the this pesto risotto with salmon. 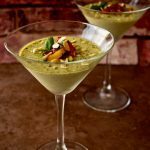 Super delicious pesto recipe that takes only 30 minutes! Place the fish stock in a saucepan and bring to simmer while you get the risotto going. By the time you need the stock, it should be simmering. Heat 2 tbsp of the butter and olive oil in a heavy based wide pan on medium heat. Gently sauté the onions for about a minute or two until slightly soft, just golden. Tip the rice in and coat thoroughly with all the lovely onion-butter mix. Add the wine and stir well. As we only have a small amount of wine, it will be absorbed very quickly. As mentioned, skip the wine if you like and proceed to the next step. Add 2 ladlefuls of the simmering stock and stir the contents of the pan. Keep stirring until the stock is almost all absorbed, then add another 2 ladlefuls. 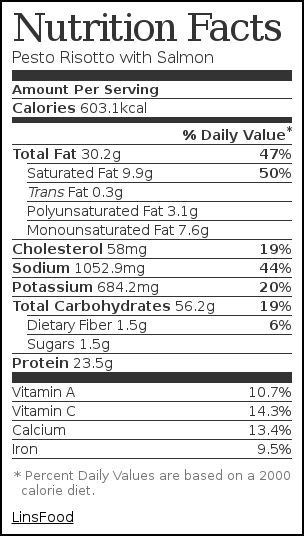 Keep repeating this, add, stir until almost absorbed until you are left with about 2 ladlefuls of stock. This will take about 15-20 minutes. After you add the final 2 ladlefuls in step 5 (with some left in the pot), tip all the salmon pieces in. Stir everything up thoroughly to cook the salmon as the stock is getting absorbed, about a minute. When the stock is almost gone, add the spinach leaves, stir for about 30 seconds for them to wilt. Add a final ladle of stock and stir until absorbed. Check your rice, it should be cooked with just a slight bite to it. If it's not quite cooked, add another ladleful of stock. Finally, when the rice is done, add the pesto in, stir for about 1 minute to heat right through and turn the heat off. Add the parmesan in (if using), the half tbsp of butter, stir, cover and let rest for 2 minutes while you warm the plates up and get your cutlery. 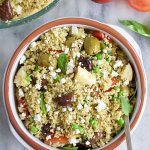 Serve immediately with some lemon juice, more parmesan, parsley and freshly ground black pepper. Simply stunning! No words for what a beautiful combination of flavours are going in here! Thank you, I’ll save this one! Thank you, Becky, it’s a huge favourite with friends and clients. Wow, what a different risotto, never thought to add pesto to risotto, thank you! This is also amazing, just came from the meatballs page. I say ignore the Italians and go with the cheese! Thanks Lin, my wife will love this.